Iran and six major world powers have managed to reach a preliminary agreement on ‘all the key aspects’ of a deal over Tehran’s controversial nuclear program, Russia’s FM has announced, adding that the sides have begun drafting the text. Experts from Iran and P5+1 have started drafting a preliminary deal and the document could be expected either within the next few hours or later on Wednesday, Sergey Lavrov hopes. However, clearing the “technical details” of a final deal may take until June, he added. “We can quite certainly say that on all the key aspects of the final settlement of this problem, the ministers have reached principal consent that will be, hopefully in the next hours, maybe a day, put on paper. The experts were tasked with this,” Lavrov told reporters Wednesday. The preliminary agreement will include the verification of mechanisms guaranteeing the peaceful nature of Tehran’s nuclear program and will stipulate the lifting of sanctions, Lavrov added. “The agreement includes an all-encompassing approach to the settlement [of Iran’s nuclear issue], including methods of verification of the nuclear program’s exclusively peaceful nature by the IAEA, as well as extensive provisions on lifting sanctions,” Lavrov said. Lavrov recalled that the “all-encompassing approach” of a preliminary agreement is based on Russian President Vladimir Putin’s position put forward several years ago. “I want to note that the whole concept that formed the basis of this work is based on the position put forward by Russian President Vladimir Putin, a few years ago, designed to approach Iran's nuclear program on the basis of the recognition of the country’s inalienable right to pursue peaceful atomic research, including uranium enrichment,” he said. The White House announced that US President Barack Obama received an update on the talks from his national security team via a video teleconference, but did not give any details. “Negotiations were completed for today. We will resume meeting at the expert level in the morning at 6.30, then Iran will join. Then, perhaps, the ministers,” said French Foreign Ministry political director for Iranian affairs, Nicolas de Riviere. However, he cast doubt on whether a political framework agreement would be reached during the current round of talks in Lausanne, Switzerland. “There is still much work to do,” de Riviere said. A diplomat close to negotiations meanwhile told Reuters it was “not true” that agreement was reached on all key issues, without specifying any stumbling blocks that remain. A draft document could soon be approved by the sides, a diplomatic source close to negotiations told journalists earlier, not specifying whether it would be a joint statement or a draft resolution. "Iran does not want a nuclear deal just for the sake of having a deal, and a final deal should guarantee the Iranian nation's nuclear rights," senior nuclear negotiator Hamid Baidinejad told reporters. "We will continue the talks until we reach an agreement over disputed issues." “We have an opportunity to realize our chances if no party to the negotiations tries to raise the stakes at the last moment to get something extra instead of keeping a balance of interests,” Lavrov stressed during a joint media conference with his Vanuatu counterpart Sato Kilman. Lavrov interrupted his participation in the talks in in Switzerland's Lausanne on Monday for a meeting with a delegation from Vanuatu, a small Pacific nation recently devastated by a cyclone. Later on Tuesday Lavrov returned to the negotiations. The Russian minister added that once a compromise is reached, the UN Security Council should dismantle the sanctions it imposed against Iran over its nuclear program. As for the unilateral sanctions imposed by the US and its allies, “we do not recognize them in any situation, whether it is Iran or any other country,” Lavrov noted. Some diplomats say an agreement may be signed during a later meeting in Geneva. 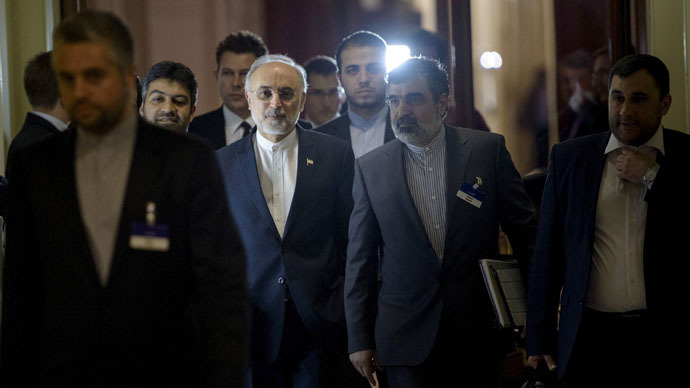 Iran and the P5+1 group, which includes five permanent members of the UNSC plus Germany, have gathered in Lausanne to hammer out a framework deal, which would settle a decade-old controversy over Iran's nuclear development. Tehran was accused of pursuing a clandestine nuclear weapons program by some countries, but insists that it only wants to use nuclear energy for civilian use. The deal would put restrictions on Iranian nuclear activities, which would prevent it from rushing towards nuclear capability while allowing it to develop a civilian nuclear industry.